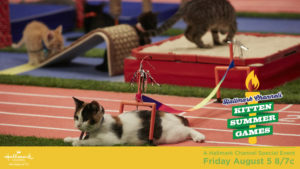 “The Kitten Summer Games” aired on the Hallmark Channel Friday, August 5th. LAST HOPE CATS WERE THE SCORING JUDGES ON NATIONAL TV. We are SO PROUD of them. Since the filming in April, all our adult cat judges-Riley, Kelsey, Haley, Charlie Brown & Schroeder have been adopted. Kelsey had her own adoption showcase in the arms of Beth Stern during the Kitten Summer Games. 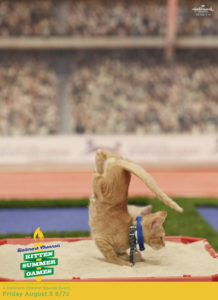 Yes, the Kitten Summer Games had a dazzling, opening ceremony too. 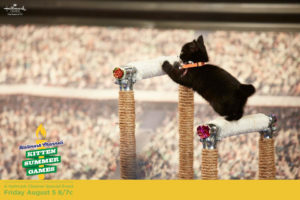 We got to root for adorable kittens competing in gymnastics, volleyball, boxing, track, tennis, pole vault, boxing, hurdles, and other events. We met celebrity “cat-letes” like Nadia Come N Scratch Me, Cat Lewis & Mary Lou Kitten..